Does physical activity affect the maternal and fetal gut microbiome? The University of Ottawa’s Placenta project could provide the answer. The placenta is a critical organ in pregnancy, providing a nutrient, oxygen and waste exchange interface between mother and fetus. Although this organ is essential to life, its role in optimal fetal health and development is not well understood. Kristi Adamo Ph.D., an Associate Professor in the School of Human Kinetics at the University of Ottawa, and her team are bridging this knowledge gap by focusing specifically on placenta research. In one on-going project, they are taking a multi-tiered approach to understanding the relationship between maternal physical activity and placenta biology. Recently, we had the pleasure of discussing this unique area of research with Dr. Kristi Adamo. A critical component of this project is to investigate gut microbiome samples collected at multiple time points from the pregnant participants (once each trimester), as well as a single collection from their infants, to assess the correlation between physical activity and the maternal and fetal microbiome – a completely novel undertaking that has not been looked at previously. We were curious about what initially drew her to this field of study, understanding more about her on-going placenta research project, as well as her future research goals. [DNA Genotek] Can you describe the goals of your research? What questions are you hoping to answer at the end of the placenta project? [Dr. Kristi Adamo] Our overall goal is to determine what sort of healthy behaviours, such as diet and physical activity, women can have during pregnancy to decrease the health risks to their child, as well as potentially across their child’s lifespan. The questions we’re interested in answering are: Does regular physical activity and diet during pregnancy alter (1) placenta biology; (2) fetal growth; (3) neonatal body composition, including adiposity; and (4) maternal and fetal microbiomes? [DNA Genotek] This is a very interesting and unique area of research. How did you initially become interested in studying the placenta and the developmental origins of human health? [Dr. Kristi Adamo] Initially, I was interested in childhood obesity, but started to notice a pattern where childhood obesity is significantly linked to maternal obesity. I often saw women that never had weight issues until pregnancy. These women gained too much weight during their pregnancy and were unable to lose the weight afterwards, causing them to become overweight. Then I became interested in how the intrauterine environment leads to programming of the baby’s future health, which led me to placenta research. The dream for this research is to be able to inform all women of childbearing age how to maximize the health benefits for their future children. This is particularly important for women with obesity, since healthy behaviours during pregnancy and early childhood years can contribute to ‘breaking’ the intergenerational cycle of obesity. [DNA Genotek] The microbiome and its interaction with the host is garnering significant interest from the research community. Why did you choose to add the collection of gut microbiome samples to your study? [Dr. Kristi Adamo] We decided to include the gut microbiome samples because there is no research about how physical activity affects the maternal and fetal microbiome. We are collecting multiple samples as part of this study. We collect gut microbiome samples from the mother at 3 time points during the pregnancy (once per trimester) and from the the mother and child about a week after birth. Our main interest is in physical activity, but we acknowledge that nutrition will play a big factor. 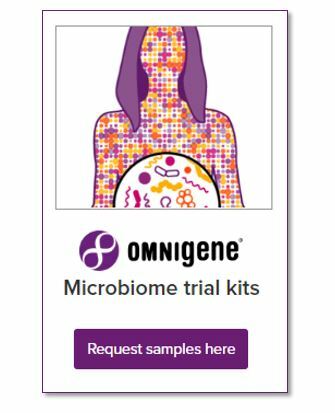 [DNA Genotek] Why did you choose OMNIgene.GUT specifically for the collection of microbial samples in your study? Could you provide any feedback on your experience using this kit? [Dr. Kristi Adamo] We chose the OMNIgene.GUT kit because the collection protocol is simple and not gross for a participant to use. Collecting poop in a margarine container is not fun for anyone involved! From what we hear from participants, they like it. They really like the toilet accessory, since it makes clean-up easy. [DNA Genotek] What type of analysis do you have planned for your samples? [Dr. Kristi Adamo] We plan to employ 16S rRNA sequencing to determine the taxonomic classification and diversity, as well as pairwise comparisons to determine if the microbiome changes between the following: (1) a mother’s microbiome pre- and post-birth; (2) an infant’s similarity to its mother’s gut microbiome to determine if it is inherited; and (3) maternal or neonatal microbiome alteration due to physical activity. [DNA Genotek] What are the main challenges you’ve experienced with your study so far; perhaps with respect to recruitment and/or sample collection? [Dr. Kristi Adamo] Recruitment can be challenging because pregnancy can be unpredictable. Some women fly through pregnancy with ease, whereas others feel miserable. For women who experience difficult pregnancies, it is understandable that they do not want to participate in research or be physically active. You need to dedicate a lot of hours and manpower to follow a woman for her nine month pregnancy. In addition to collecting stool samples, we also collect the placenta immediately after birth. Collecting the placenta within this narrow time frame requires a lot of dedication and coordination from our staff, because the time between the start of labour to delivery can be very long. [DNA Genotek] What are your next steps once this project is complete? What do you see as your next focus area for your research? [Dr. Kristi Adamo] We would like to follow the children longer term as part of a longitudinal study. [DNA Genotek] Do you have any advice for young scientists interested in entering your field of research? [Dr. Kristi Adamo] Be prepared for the challenges associated with human pregnancy research, such as recruitment, the nine month timeframe, timing, ethics or delivery being a challenge. If you can overcome these obstacles, it is a very fruitful area of research because there is a huge knowledge gap in this area. Remember: pregnancy used to be an exclusion criteria for research. On behalf of everyone at DNA Genotek, we want to thank Dr. Kristi Adamo and all those involved in the Placenta research group, for sharing this information with us. If you’d like to read more about Dr. Kristi Adamo’s research projects at the University of Ottawa, you can visit her page. If you would like to learn more about the OMNIgene.GUT microbiome collection kits referenced in this article, contact us at info@dnagenotek.com.